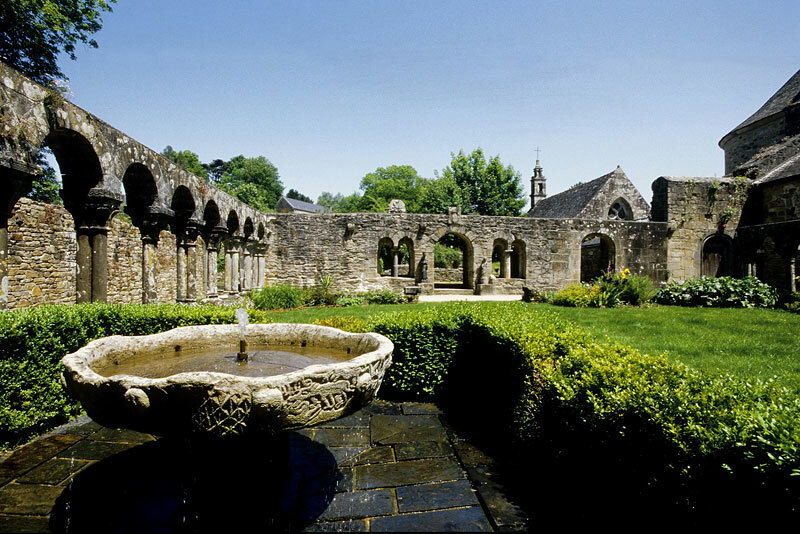 Located deep in the bay of Brest, the park at Daoulas abbey benefits from a mild climate which favours the acclimatisation of plants from all five continents. An exceptional garden of medicinal plants can be found here. Inspired by the monastery gardens of the 14th century, it is home to more than 350 species of medicinal, herbal and exotic plants and spices, some of which are even said to have magical powers. A continuation of the visit reveals a romantic-style park with large open spaces, humid zones, ponds and remarkable trees. The path gradually unveils the richness of the architectural heritage, which bears witness to the splendour of the former 12th-century monastery. The park at Daoulas abbey has developed over the course of time and is marked by a distinctive duality. Located above the abbey church and monastery garden, the medicinal garden covers two terraces which were laid out in 1994 and 1997 in place of an old fruit and vegetable garden. Broadleaved paperbark trees, aloe, tea plants and New Zealand flax can be found here. No fewer than 300 species originating from five continents are represented on an area covering 3,000 m2. They invite visitors to embark on a journey of discovery, revealing their diverse and frequently unrecognised uses as medicinal and herbal plants and spices. The lower terrace includes plants from traditional western European pharmacopoeia while the upper terrace is home to plants from five continents which have succeeded in becoming accustomed to the Breton climate. In its current form, the garden draws on the ideas of monastery gardens as well as those of mediaeval and parish gardens. It is inspired by a meeting of cultures, simultaneously forming one of the main axes of the “Chemins du Patrimoine en Finistère” cultural programme (Heritage Trails of Finistère). Conceived and realised approximately 20 years ago, the garden has now reached full maturity. The park is very different in appearance. Located on a hill, it is characterised by wide open spaces. Water plays a defining role in the shape of ponds, streams and humid zones. These various environments and the different ways in which they are maintained have resulted in the development of a wide variety of conditions and a diversity of flora which changes throughout the seasons. This park is the result of works which were carried out in the 19th century, when it was re-designed as a landscape garden and the remaining monastery buildings were converted into a bourgeois residence. This period was marked above all by the planting of large conifers and palm trees. The park’s remarkable majestic trees (Atlas cedars, Lambert cypresses and Monterey pines) were probably added at the beginning of the 20th century. A stock of poplars planted around 1960 was a striking feature of the park for many years. It was, however, decided to fell the trees in 2012 because of their dangerous condition. This major transformation in the park’s physical appearance was an opportunity to subject its design to a thorough review. The subsequent project continues the tradition of medicinal gardens while also including medicinal trees and shrubs from all over the world, thereby forging a new link between the upper and lower parts of the park. Since 2006, the park at Daoulas abbey has been under the management of the public body “Chemins du Patrimoine en Finistère”, financed by the “Conseil général du Finistère”. The garden was awarded the title “Jardin remarquable” by the French Minister of Culture and Communication in 2012. The complex is a noteworthy example of architectural heritage, part of which is classified as an “historical monument”. March 28. to July 4. daily from 1.30 p.m. to 6.30 p.m.
July 5. to November 2. daily from 10 a.m. to 7 p.m.
November 3. to January 4. daily from 1.30 p.m. to 6.30 p.m.